Apologies for the late update on this blog! It has been an exciting and busy week because there were too many birthday celebrations throughout the week, ever wonder why there's so many September babies every year? Yes you've got it right! They were conceived in holiday month (December) that's why. Back to today's write up. 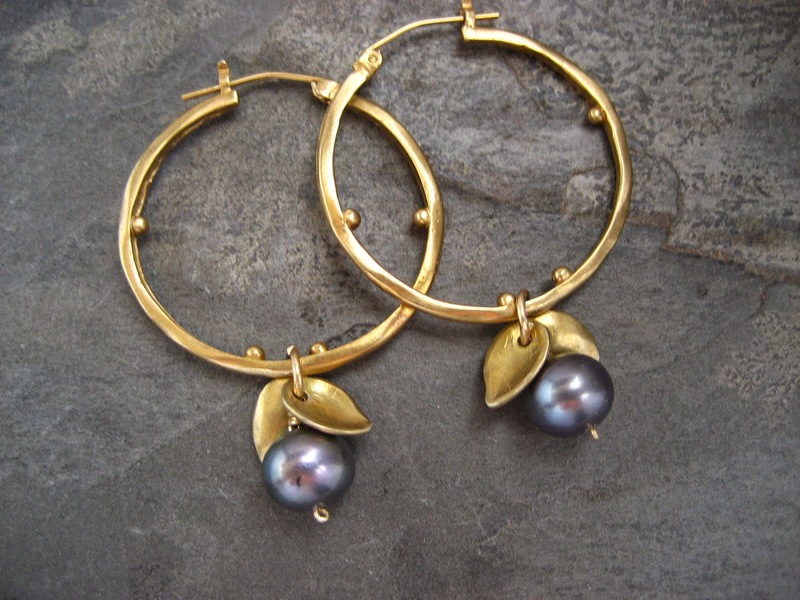 Though I am born in September and my birth stone should be sapphire, I am very attracted to pearls since I was really young, and when Etsy sent me Elfi Roose's Freshwater Pearl and Vermeil Leaf Hoop Earrings in my feed, I knew I won't be procrastinating on updating my blog! Theaw hoop earrings are made with freshwater pearl, sterling silver with 18k gold plating, the blue freshwater pearl is hand wire wrapped, and dangles between 2 beautiful gold plated leafs. The hoops measure a little over 1 1/4 inch in diameter, the length with the pearl measures 2 inches. I moved on checking out her other pearl's collection, and found a couple more that I like. Above bangle is Vermeil bangle with grey/blue fresh water pearl, made with solid sterling silver, 14k gold plating, fresh water pearl. This irregular heavy weight round shaped bangle was hand carved out of wax and casted in sterling silver. The oneven shape is what gives this piece an organic feel, any small imperfections are left intentionally, to maintain the signature look of Roose's jewelry. 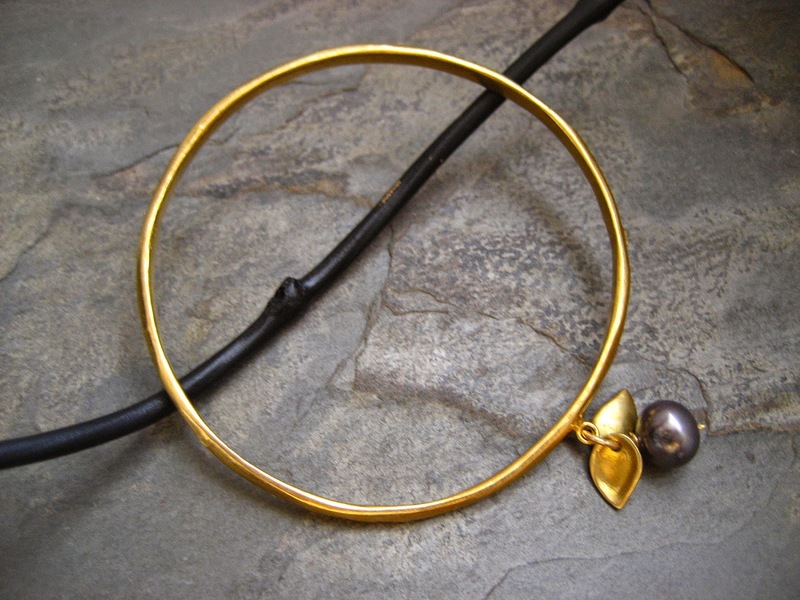 The charm with 2 vermeil leafs and a fresh water pearl dangles freely of the bangle, giving the piece that extra edge. The bangle measures the standard size of 2 1/2 inches from the inside, the width measures 3mm. Elfi Roose describe this piece as solid and heavy. The surface has a soft semi-matte gold finish. 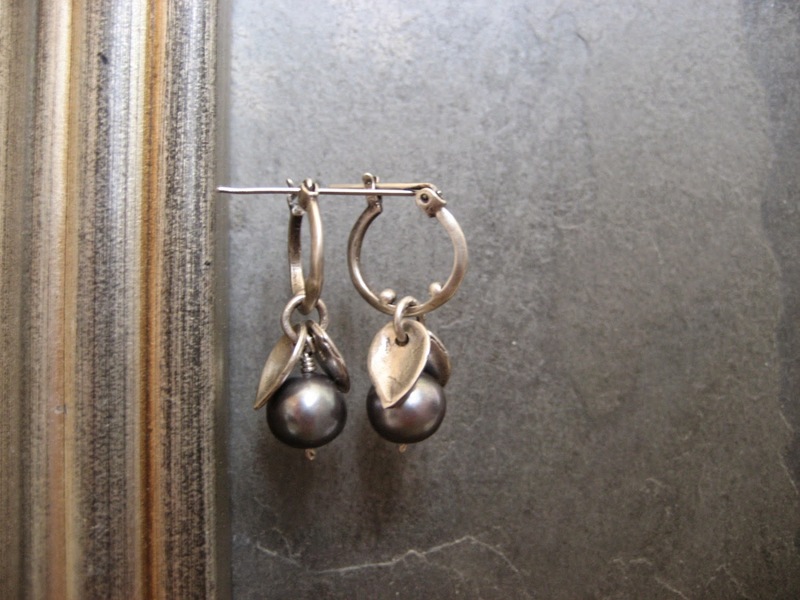 If you are not entirely into large hoops earrings, Elfi Roose has something tiny and elegant, but equally eye catching too: Freshwater pearl and sterling silver hoop earrings. These little hoops are sterling silver that have been slightly oxidized. 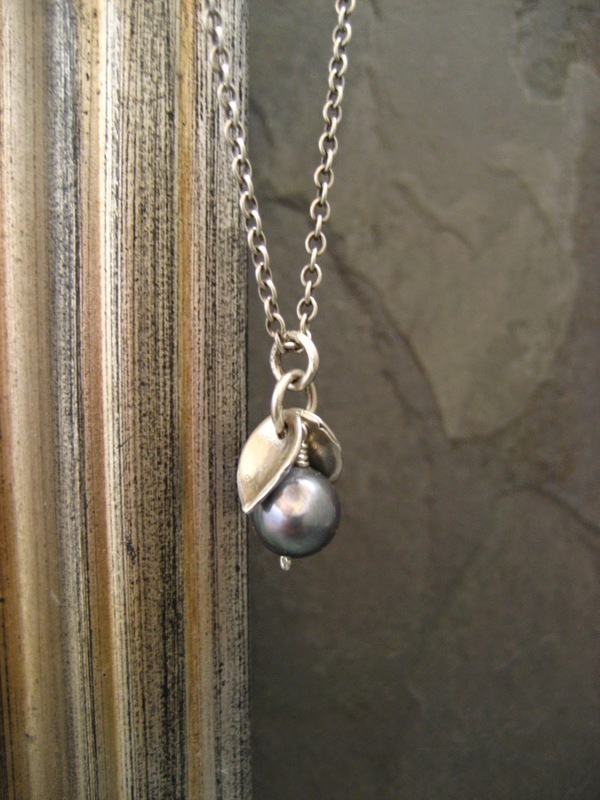 The blue freshwater pearl is hand wire wrapped, and dangles between 2 beautiful sterling leafs. Earrings measure a little 13mm in diameter, the total length with the pearl measures 28mm (approximately 1 1/8 inches). All elements used in these earrings are handcarved out of wax and casted in sterling silver - quality assured. adjusting. The pendant measures 7/8 inch in drop. Be sure to drop by Elfi Roose's store soon, ya know, Christmas is around the corner!